(Three generations of John Rodgers, 1772 to 1926, served in the Navy with distinction). Type and Characteristics - Originally steam whaler Mary and Helen, built for Arctic navigation by Goss, Sawyer & Packard of Bath, ME, launched 17 July 1879, 420 tons, 138ft long x 30ft beam x 16ft 8in depth of hold, 6-8kts, 35 crew. 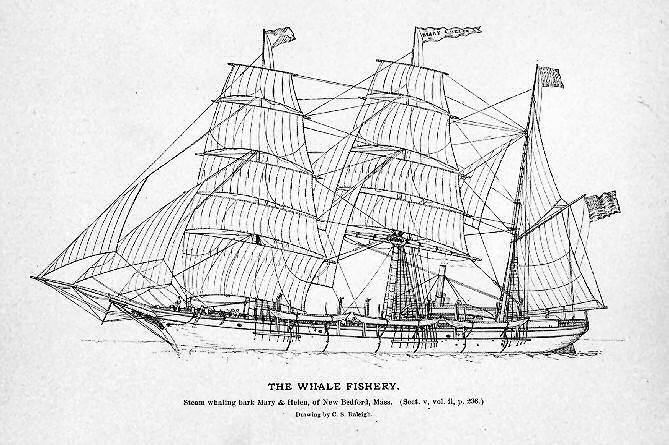 She was the first steam whaler built for American registry. Acquired by the Navy at San Francisco, renamed Rodgers, commissioned 30 May 1881, crewed by Navy volunteers and commanded by Lt Robert M. Berry. Log Period and Areas of Service - 1881, Search for USS Jeanette and DeLong's Arctic Exploring Expedition, Alaskan and Siberian waters. Also for two missing whalers. Early July 1881 - Arrived Petropavlosk, Kamchatka Peninsula, Siberia. Continued north to St Lawrence Bay, Siberian side of Bering Straits. 20 August 1881 - Entered Arctic Ocean. Arrived Herald Island to find USRC Corwin had already searched the island for USS Jeanette. Then headed for Wrangell Land. 13 August 1881 - Departed Wrangell, having discovered it was an island and not part of the polar land mass, searched north and west, but stopped by pack ice on 27th. Turned south to winter. Early October 1881 - Left party under Master C F Putman on Tiapka Island off Cape Serdze (100 miles from St Lawrence Bay) with supplies for a year, and with boats, sleds and dogs to search to the west for the Jeanette and the missing whalers. 8 October 1881 - Steamed for St Lawrence Bay, but bad weather prevented most of her supplies being transferred ashore. 30 November 1881 - Fire broke out and ship lost next day. The crew sheltered on shore, divided into four parties, and wintered in the village of Noomamoo and three others nearby. Master Putman had learnt of the disaster and carried relief supplies to the survivors. On returning to his camp, he lost his way and drifted out to sea on an icefloe. He was never found. 8 February 1882 - Lt Berry set out to search along the Siberian coast for the crew of USS Jeannette. 24 March 1882 - Reached Russian post of Nishne to learn that some of the crew had landed at the mouth of the Lena River the previous September. Berry returned home. The rest of his surviving crew left St Lawrence Bay in May. Fate - Fire broke out in packed hold an 30 November 1881 in St Lawrence Bay, stores were removed during the day but ship had to be abandoned at midnight. She drifted up the Bay on fire, and sank on the 2nd December.